– simply get off at the Subway Station I mention and follow the general crowd . chances are the area would be big enough it won’t matter which Exit you take . reflecting the prestigious art school persona, the West block heading up to the University from the subway station is full of late-night jazzy, funky, and whatever clubs, while the vast East block has imaginative cafes along the countless art studios and one-rooms (studio apartments) where art students live and work . historic playing ground leading from the circular ShinCheon intersection long towards YeonSae University . all sorts of beer halls and cafes where the Western block of the road is a historic open market “ShinCheon ShiJang” . this is an immense watering hole for students living in and communting to the vast Western region of Seoul . both ShinSaeGae and Lotte Department Stores have a joyful grocery area underground floors with well defined wine selections . if you like Korean ready-made food such as Kimchi I strongly suggest you buy it here, for they have adapted to Japanese taste palette thus much less hot & spicy pickled variety . and in the middle of two department stores awaits the Seoul Central Post Office, the big glass building at the North-West Entrance to MyungDong . a discount haven once for G.I’s to come out of the near U.S.Base and buy cheap clothes, luggage, custom-made shirts and suits . with the gradual news of the Base relocating, Japanese ladies have come to have custom-made leather, and Chinese tourist abound . as the center-stage of international entertainment, iTaewon is synonym for all things gay and transvestite, thus all hair salons specialize in hair-extension . it is common you stand next to an attractive female at the crossing, and then you hear her speak to her friend in a husky man’s voice ..
one subway stop before JamSil Lotte World, the playground the young romantics, you find the poor-youngsters playground which gradually grew from a few alleys of nothing to bargain cafes, restaurants and clothing stores . from across HyunDai Department Main Store forming a large triangular block of affluent boutiques, cafes and restaurants where Japanese is popular . yes if you are from L.A., here’s another Rodeo Drive spawning South from West & East Wings of the affluent Galleria Department Store full of European Designer Branches . across from the main intersection : South-West lays the smaller boutiques, trendy cafes and fusion restaurants, while South-East awaits Korean Designer HeadQuarters as well as renowned Art Galleries . 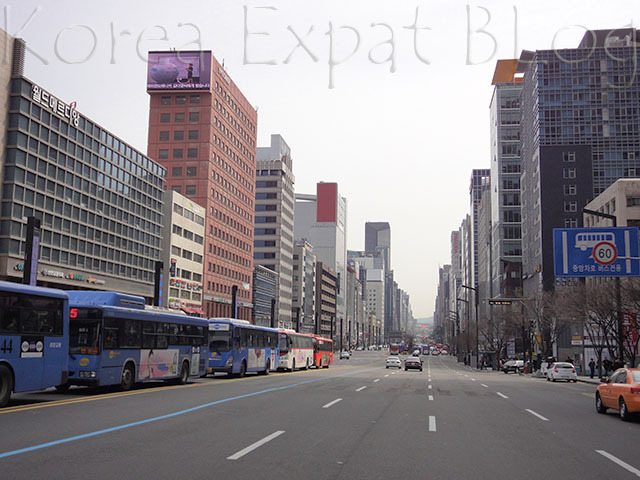 this is where the second life of Seoul spawned in the real-estate Boom South of the Han River . on the North West & North East block of the subway station : endless cafes and fusion restaurants for the young & hip . South-East is more of a start-up business district and South-West leads to residential apartments . the old rich neighborhoods started North of downtown Seoul in SamChungDong near the presidential palace and over BukAk Mountain where art galleries have eventually formed . at this time the majority of expatriates were technicians and businessmen adhering to the development of South Korea, living in a large area of HanNamDong . over 1980’s as mass real estate development under way South of the Han River : Seoul saw sudden influx of nouveau riche population forming new neighborhoods . a quiet hill in BanPo area was one such neighborhood . and the French community broke off one-by-one from HanNamDong into this area eventually forming SeoRae Maul (Village). then bakeries and cafes opened up adhering to their tastes and voila ~ Korean fashionistas to follow . it really is a small area in one stretch of road up-hill, but if you haven’t found your needs of aperitifs & desserts Francaise in iTaewon and HanNamDong then head over for a sip . this is walking distance West-ward from Central City – one of the major shopping centers mentioned in my Mammoth Shopping Complexes page . Subway Line 7 GoSokBus (Express Bus) Terminal Station Exit 5 – is the narrow road to your left on the next large block . one single narrow road-full of cafes and (Korean) restaurants serving party-goers who drop for late-night dates after the club scene . hostesses who haven’t found a partner for the night gather here after the wee hours of the night . thus Love Motels here . hosts, limited to Seoul are less common than Japan .